The case for a formal inter-governmental process to promote international adoption of the resale right for visual artists has taken an important step forward following the first ever full conference at the headquarters of WIPO in Geneva dedicated to the issue. The conference, organised by WIPO before its Standing Committee on Copyright and Related Rights (SCCR), had been scheduled by the UN agency in 2016. It aimed to provide information and improve knowledge about the right among Member States, study its economic impact and understand its importance for creators. The event saw overwhelming support for further action by WIPO to encourage global adoption of the right. The resale right grants artists a percentage of the sale price when their works are sold in auction houses or galleries. It exists in more than 80 countries, but many artists are losing out in countries where the right is not implemented into national law, such as the United States, China, Switzerland and Japan. The conference opened with speeches by two key figures who have helped champion the debate on an international resale right – WIPO Director General Francis Gurry and H.E. Mbagnick Ndiaye, Senegal’s Minister of Culture. Francis Gurry said more than 80 countries currently have provision for the resale right, and it is under activie consideration in a number of other major countries. Mr Ndiaye recalled the legacy of Ousmane Sow, former CISAC Vice President and a prominent sculptor, who passed away at the end of last year and was a strong advocate for the right. He said the resale right would establish a balance between artists and those who trade in their works. “This law is of utmost importance to artists regardless of where they come from”, he added. The conference then turned to discussion of “The International Development of the Art Market” and “The Importance of the Resale Right for Artists”. Creators eloquently highlighted the fairness of the resale right and its benefits to artists. They included Kazuhiko Fukuoji (Japan), Helal Zoubier (Algeria), Julio Carrasco Breton (Mexico); Hervé di Rosa (President, CIAGP), Romuald Hazoume (Benin) Mattiusi Iyaituk (Ivujivik, Canada) and Richard Wentworth (UK). Panellists emphasised that the right is about respect for visual artists. They also highlighted the need for international adoption in order for artists selling in overseas markets to benefit from reciprocity rules. “The resale right needs to be international and it needs to be fair” said Hervé di Rosa, French visual artist and President of CIAGP. The resale right is of particular importance to artists in developing markets with enormous growth potential for the sector, but inadequate means for funding the work of new visual artists. “I’m speaking for all African artists – you need to act now, otherwise we will just continue with this injustice”, said Romuald Hazoume from Benin. A written statement from the aboriginal creator Kamahi Djordan King reminded the audience of the importance of the right for indigenous communities, where the proceeds from the second sales of works “feeds our kids and our grandkids”. He said it was important that the indigenous communities themselves, and not outside commentators, should decide on the benefits of the right to these communities. One of the key highlights of the conference came with an early insight into the findings of a new economic study on the resale right, which had been commissioned by WIPO to set the background for international discussions. Study co-author Katheryn Graddy of Brandeis International Business School in the United States noted that there had been concerns from auction houses that the resale right might lower prices and therefore hurt young artists. However, the findings of two economic studies firmly contradicted this suggestion. Graddy was commissioned by WIPO, along with a French academic Joelle Farchy, to look at the economic impact of implementation of the resale right. Graddy outlined an initial study that compared the price and volume trends of more than 570,00 artworks in order to understand the impact of the resale right over the period from 1996 to 2007. It found that, in the UK, the prices of art works subject to resale right grew on average by 7.7% per year. This compared to annual growth rate for works not subject to the right of 5.5% per year. She also said that a follow-up study commissioned by WIPO “came to exactly the same conclusions”, covering the years 2002 to 2014. She said that the new report will be submitted to WIPO “at the end of the summer”. Concluding on the findings of her research, Graddy told the conference “There is little evidence that prices have dropped because of the implementation of the resale right. Artists are overwhelmingly in favour and it clearly encourages and motivates artists which is the purpose of intellectual property in the first place”. The conference heard further evidence of the benefits brought to visual artists by the resale right. Marie-Anne Ferry-Fall, President of European Visual Artists and Director General of ADAGP has outlined that the resale right is not just an economic right but also serves as a recognition of the artists’ work. 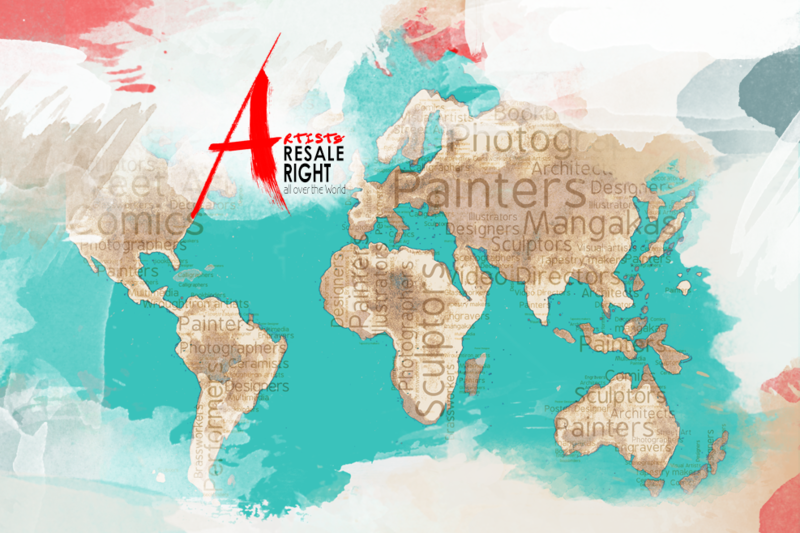 European Visual Artists together with CISAC and GESAC have been leading a multi-annual campaign for a global adoption of the resale right, providing support to artists and CMOs managing the right as well as advocating its benefits with national and global policy makers. In France, ADAGP has put efforts to ensure efficiency, transparency and simplicity, facilitating the collection process and ensuring that all parties are well informed of the application of the resale right, by maintaining permanent contact with hundreds of galleries and other art market professionals. In 2016, ADAGP has collected 12.8 million Euros, 8 million from France and 5 million from abroad with 43% of the artists receiving the royalty being living artists. Insights into the Nordic Countries’ implementation of the resale right were presented by Mats Lindberg, CEO of the Swedish CMO Bildupphovsrätt. He emphasized that a sound legislation is required in order to guarantee that authors receive remuneration and also ensure that weaker markets are compliant with the legal requirements of a solid system. Mats Lindberg also shed light on the positive contribution of CMOs in managing the right where collective management is mandatory: this takes a burden off the market and provide for an easy and cost efficient reporting system. In the UK, the visual artist society Design and Artists Copyright Society (DACS) says that it has distributed more than £50 million to over 4,000 artists and estates since the right took effect in 2006. In Australia, resale right collections started in 2010. By October 2016, it had already generated more than 4.5 million Australian dollars for more than 1,275 artists. CISAC data demonstrates the value of the resale right to artists at a global level. In the countries where the right exists, it helps generate total royalty collections of some US$50 million (€44.9 million), amounting to 25% of total global visual arts collections, according to CISAC’s 2016 Global Collections Report. The Geneva conference highlighted the growing momentum, universal artist support and economic merits of international adoption of resale right. Progress is visible in key countries, including China (one of the biggest global visual arts markets) where the right is included in a new copyright bill, as well as in Argentina. A further report from WIPO is now expected within the framework of the work of the SCCR. This will be submitted for discussion along with the study of economic impact to WIPO Member States. A decision will be made as to how the discussion should be taken up within the SCCR agenda itself, which would be a significiant step forward. Wrapping up the conference, WIPO Deputy Director-General Sylvie Forbin said the exchanges demonstrated the need to continue discussions. She added that there is growing interest among countries to have an international framework on the issues. WIPO, she said, is committed to providing a forum to continue discussions and help find solutions, to help artists be a part of the global copyright system. WIPO hosted an opening reception the evening before the conference, attended by artists, Member State representatives and experts. WIPO Director General Francis Gurry highlighted the importance of the discussion and recognised the efforts of Senegal and CISAC in bringing resale right to the fore of the global stage. CISAC’s role in putting in place the framework for global adoption was also acknowledged by WIPO’s Director General who noted that CISAC had been the source of this international initiative for the resale right at the outset of the international campaign in 2014.